You know you’ve been busy when you look down to see your nails chipped and fading. Or worse, your nails have been bare for weeks. Instead of rushing a DIY manicure (we’ve all been guilty of a one-coat and go job), take just a few extra minutes to ensure the color lasts at least a week, maybe even two. Follow our simple guide below. Regardless of whether or not you’re wearing nail polish, swipe each nail with nail polish remover. Even the tiniest bit of oil on the surface will hinder the polish from sticking to the nail. The cleaner the nail, the stronger the hold. Adding a top coat adds strength to the polish, making it thicker and less likely to chip. When applying your top coat, add extra protection to the tips (where chips are most likely to occur) by lining the tip and then the entire nail for double coverage. Gel manicures have been slated as the go-to for busy lifestyles, but scheduling out enough time for the salon or the ten-step version at home isn’t feasible. 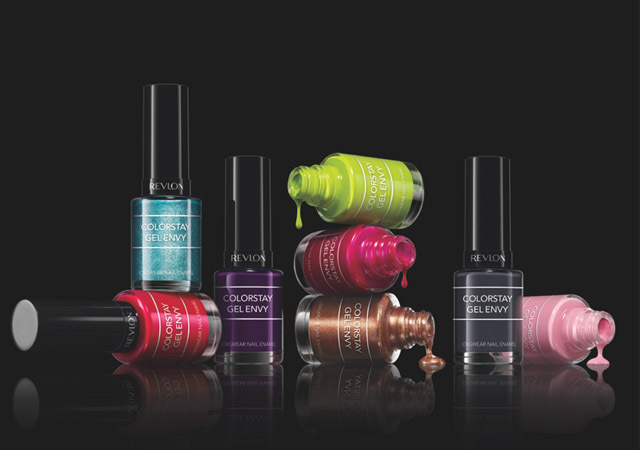 Instead, opt for the new Revlon ColorStay Gel Envy Longwear Nail Enamel. The two-step process provides salon quality color in less time and doesn’t even require a lamp. The vivid colors offer brilliant shine and life-resistant wear. Included is the Revolutionary Colorstay Gel Envy Diamond Top Coat that delivers a protective coating for long-lasting strength and shine. The polishes are so smooth, a base coat isn’t even necessary. Immediately after painting, soak the nails in ice cold water to speed up drying time. You can also stick to a cold shower the day of and wash your hands with cold water during the mani’s entire lifespan. Keep the manicure strong with a high shine by swiping them with top coat daily. After every hand wash (especially in the winter) dab the cuticles with cuticle cream or oil. Rough cuticles cause the polish to break on top. When a chip is inevitable, sand over that part of the nail with a buffer to soften the jagged edge. Then paint the bare section and coat the entire nail with a top coat to smooth out.